The HQ Rush V is affordably priced with high quality materials and construction. The Rush V (2 line trainer kite) and the Rush V Pro (3 line trainer kite) are built like a tank, yet fly like a butterfly. Using a trainer kite is all about learning how to properly steer your kite and learning basic kite flying maneuvers. The goal is to build muscle memory in order to master kite control. Learning to properly fly a kite is critical to learning how to kiteboard and other power kiting sports. The Rush V is not only tough, but the reduced bridle lines and reshaped design offers safe and easy set up. It's a very stable kite when flying in different wind conditions. The kite's internal cell structure with diagonal webbing provides uncompromised strength and durability. For a 2 line kite, the Rush V offers a bridal configuration that provides for a simpler self relaunch and is about as good as it gets for a 2 line kite. 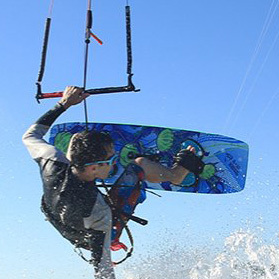 Today, kiteboarding and snowkiting are becoming more and more popular with younger kids. Kites and gear are becoming more user friendly and are much safer to fly. The Rush V offers smaller size kites with extremely durable construction that will stand up to a lot of abuse. The 200 and 250 are a great sizes for families with younger kids. The 300 is a good size for adults, providing a strong pull in winds over 15mph. Children should always fly with adult supervision! The Rush V offers smooth and precise flying action and is very stable when flying in different conditions. This is a good trainer kite for learning kite control, muscle memory, maneuvers, and how to safely fly your kite in the wind window. The Rush is also designed for great light wind performance. The Rush is rated to fly in wind ranges from 5mph to 24mph. Our experience is 8 mph to 20 mph are the best. Flying even small kites without experience will always increase the power generated by the kite and will also cause the kite to respond extremely fast making it more difficult to control. Children should never fly a kite in high winds (exceeding 12 mph) and should always fly with adult supervision. These trainer kites can really zip in higher winds. Kite size and power recommendations in 8mph to 12mph winds for a person over 140lbs. The 300 has enough power to pull an adult on a mountain board or snow kiting on hard packed surfaces. The Rush is one of the most durable trainer kites on the market. The Rush is strong enough to handle the stress of pulling you across the snow or on a landboard on hard pack surfaces and in stronger winds. The Rush V 2 line trainer kite comes with everything you need, ready to fly.